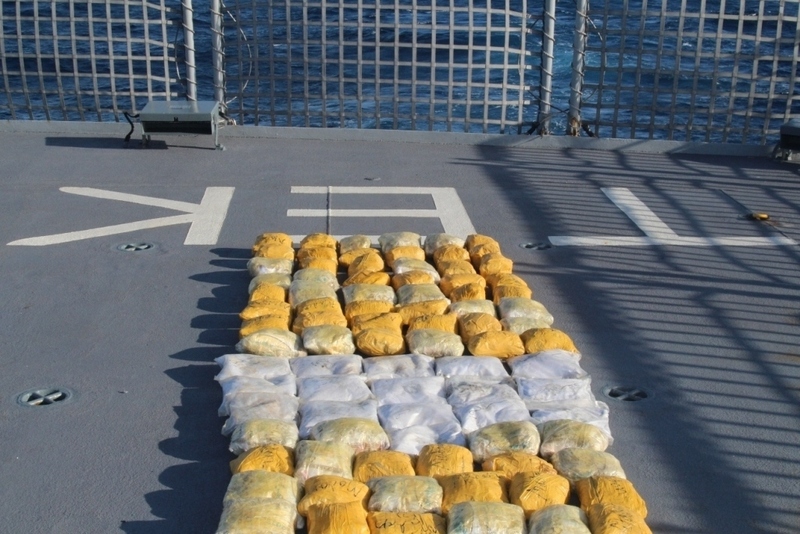 Her Majesty’s New Zealand Ship (HMNZS) Te Kaha commanded by Commander Simon Griffiths RNZN, has seized 257Kg of high purity heroin with a United States street value of $164.5m. Over the last 7 weeks, Te Kaha has been operating at the forefront of CTF-150 as part of their Surge operations to stop illegal trafficking of drugs which can be used to fund terrorist activities in the Indian Ocean. Under the French CTF150, Te Kaha, was able to intercept board and discover the illegal drugs on two separate occasions. In addition to the intelligence received from the Combined Maritime Forces (CMF) headquarters in Bahrain, Te Kaha was able to use information taken from New Zealand Air Force assets supporting CTF-150 operations. 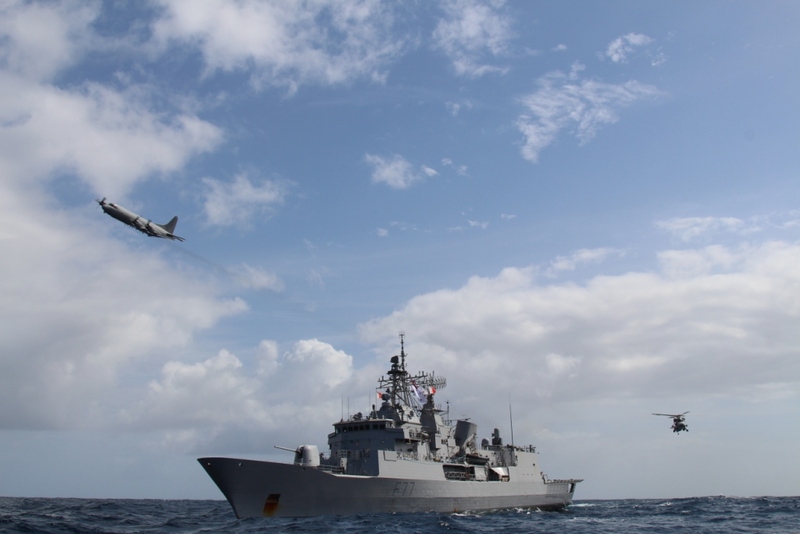 It was information directly supplied by the P-3K2 Orion fixed wing asset which identified the latest dhow to be boarded and have narcotics seized. With this quality intelligence the Te Kaha was able to track down the wooden dhows which had the hidden heroin and make the approaches. After getting the appropriate authority to board, Te Kaha’s boarding team commenced their search utilising a range of techniques including keyhole and destructive searching. Their months of training paying dividends in the fight against drug smuggling by keeping narcotics off the streets, potentially around the world. CTF150’s mandate is about promoting the conditions for security and stability in the maritime environment by countering terrorist acts and related illegal activities. Te Kaha has done this through maritime security patrols in the Area of Operations. Information gained on these patrols is continually reported back to CMF and the CTF150 Commander. The ship has also boarded vessels suspected to be aiding terrorism by conducting illegal activities such as smuggling narcotics. The activities of CTF 150 directly influence events ashore, denying international terrorists the use of the seas as a venue for attack or as a means to transport personnel, weapons, or other illicit material. 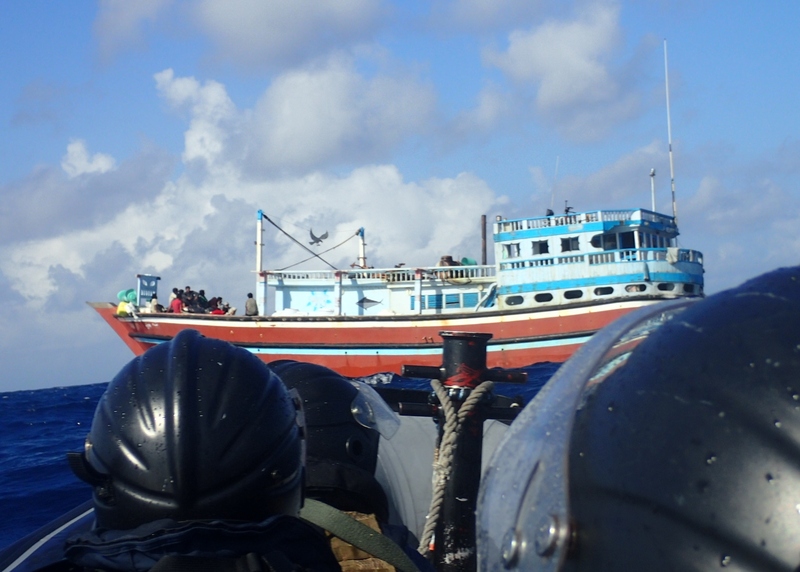 During Te Kaha’s time supporting CTF 150, they boarded and reported on vessels suspected to be carrying narcotics. The main focus of CTF 150’s operation being to stop as such narcotics providing funding to terrorism.